What exactly is a stretch mark? 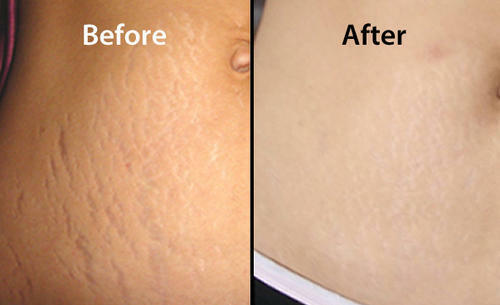 Stretch marks also called as striae occur when the skin changes its shape due to rapid stretching beyond its natural limits. It can occur due to rapid weight gain or sudden weight loss , during pregnancy ,also at puberty in adolescents. Also occurs due to strenuous exercises that leads to excess stretching of the skin . Stretch marks can occur in various colors.In the initial stages it appears in slightly red-pink in color and over time can turn brown to black depending on skin type and end up in white color streaks as most of us observe. There are many creams and lotions and home-made remedies claiming to be effective for the treatment but the results on these are debatable. As the cause of stretch marks is due to loss of elasticity in the dermal layer, treatments that promote elasticity in the skin would only help in getting rid of the stretch marks. Some of these treatments include regular chemical peeling , or Micro needling RF, fractional CO2 lasers, derma roller etc. At OUR clinic we focus on giving you the best result.On consultation ,our doctor examines and decides as to which treatment would be the best for your skin type.